Activists including conservation groups, animal rights supporters, and First Nation tribe members have serious qualms about the hunting of these bears for pure sport. British Columbia's controversial annual spring grizzly bear hunt began on Apr. 1, with an estimated 1,800 hunting authorizations being issued - one of the highest numbers in recent years. Grizzlies, which are considered "threatened" by the U.S. Endangered Species Act, do not have the population numbers that black bears do, and activists including conservation groups, animal rights supporters, and First Nation tribe members have serious qualms about the hunting of these bears for pure sport. 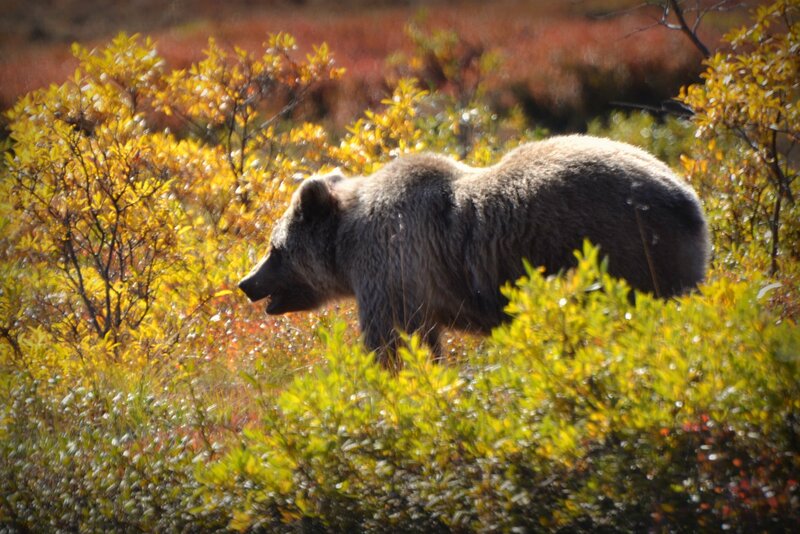 This year's grizzly hunt lasts until the end of May, and is followed by an autumn hunt that takes place Oct. 1 through mid-November. On average, about 300 of these bears are killed by hunters per year, but that number might increase from an uptick in hunting authorizations. The Canadian province where the activity will take place is home to about a quarter of the remaining North American grizzly population. Robert Johnson and Jason Moody, two brothers from the Heiltsuk First Nation, recalled commonly seeing a grizzly bear while working as field technicians in a coastal estuary, flanked by what was known as the Great Bear Rainforest. The young male bear, whom they nicknamed "Cheeky," would follow them around from a distance, often poking his head out at them and sticking out his tongue. The brothers were also there on the day that Cheeky was shot to death by a big-game trophy hunter. The bear's killer, Clayton Stoner, skinned Cheeky and took his hide. He chopped off Cheeky's head and paws. Though the brothers arrived too late to stop the hunt, they did find Cheeky's mangled remains, which had been left there to rot. "I was devastated," said Moody. "I had hoped to save his life." He and his brother, he said, had developed quite a bond with the bear, who had a playful curiosity and friendliness. Johnson remarked that during their time there, "We started talking with Cheeky, telling him what we were doing there. We got to know him quite well, to the point we could go in our boat and get off and walk around in the area without having to worry about him." Stoner kept the bear as a trophy, even balancing the animal's severed head on his knee and posing for a photo. Brothers Johnson and Moody, meanwhile, returned to their research camp near the estuary and wept for the loss of their friend. This is merely a single example of what is increasingly being viewed across Canada as a moral atrocity, and British Columbia is now seriously debating the continuation of grizzly trophy hunts. Thirteen years ago in April, a moratorium on the hunt was enacted, but quickly overturned within months. On Feb. 15, protesters gathered at the B.C. legislature buildings in the provincial capital of Victoria, demanding a permanent province wide ban on grizzly bear trophy hunting. And they posed their argument not merely in moral terms, but in economic terms as well, noting that over 11,000 tourists came to Canada to visit the bears in 2012, and contributed $9.54 million to the GDP. Trophy hunting, on the other hand, only generated $0.7 million that year. Chelsea Turner, daughter of British Columbian wildlife filmmakers Jeff and Sue Turner, spoke at the demonstration, remarking, "I realized that when we go out on location to film this spring, it will be the same time the spring trophy hunt begins. It's just appalling to me. It breaks my heart to think that one day we're working with these bears and shooting them with our cameras, and the next day trophy hunters can show up and shoot them with their high-powered rifles. This is completely the wrong direction that we're moving in." Biologist Paul Paquet of the Raincoast Conservation Foundation said grizzlies could be too few in numbers to risk a trophy hunt at this time. "The real numbers could be somewhere as low as 6,000 or as high as 18,000," he said. "We just don't know." But the real question he said, is, "is this ethical, to be hunting bears? That's really what's at issue. This is a trophy hunt, as opposed to a hunt for food." And according to First Nation members, these big game hunters are not doing anything particularly brave, difficult, or admirable. The bears in the area are accustomed to seeing people, due to tourism, and thus do not fear guns - until it's too late. Doug Neasloss of the Kitasoo/Xai'xais Nation suggested it isn't so much a hunt as it is senseless slaughter. When asked whether a grizzly is hard to catch, Neasloss replied, "No. My grandmother could shoot a grizzly."